midweek randoms – it’s almost vacation time! I’m starting to feel a little stressed out. The husband has been away for two days and we’re getting ready to go on vacation. You get a random post because of all of this. 1. I’ve washed no fewer than 5 loads of laundry this week (and I have one more to go.) I’ve folded everything and put most items away. I have not packed said items. 2. I have packed enough pouches of food for 10 days for the kiddo. (The pouches are vegetables, yogurt and snack-type items since he still doesn’t love most solid vegetables.) I’ve also downloaded two episodes of Sesame Street. I’m good, right? I don’t have to pack anything else? 3. I’ve started to come down with a cold in the past 24 hours. I blame one co-worker who has been coughing all over the office today. And stress. When all else fails, blame stress. 5. I managed to get the car’s oil changed this morning. And they vacuumed my car. I felt like I won at Wednesday. 7. My brother has been in town this week and the toddler is OBSESSED with him. He learned Jason’s name within just a few minutes (we haven’t seen Jason since March, maybe? End of February?) We’ll be sad when Jason goes home at the end of the week. 8. 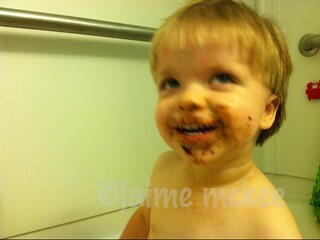 This is a blurry photo, but can you tell someone enjoyed his ice cream sandwich?